There has been a lot of talk about social enterprise (SE) over the last few years, with many ideas about what it is and what it means for the future of our communities. While there is no one definition of social enterprise, most agree it involves the combination of business savvy market activity with the mission-focused purpose of the nonprofit/voluntary sector to bring about positive impact. From research and experience, we know that Ontarians have sought to achieve both economic and societal goals for community benefit. The concept of doing good while earning a profit may not be new, but recent interest from politicians, academics, and community organizations has pushed social enterprise into the limelight. With the increasing number of socially-minded start-ups and the creation of the Office for Social Enterprise by the Government of Ontario, it is vital to have accurate and updated information about the social enterprise sector in this province. An enhanced understanding will enable policymakers, intermediaries and community stakeholders to better support the development of a social economy that provides opportunities for employment and training as well as offer environmental, cultural and social benefits. 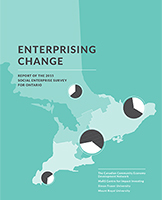 This is the purpose of the 2015 Social Enterprise Survey for Ontario: To provide a snapshot-in-time profile of this province’s social enterprise sector, in order to increase awareness and inform actions to support its development. This report builds on previous research that the CCEDNet conducted in 2012, titled ‘Inspiring Innovation: the Size, Scope and Socioeconomic Impact of Nonprofit Social Enterprise in Ontario’. It also contributes to the national profile being created through similar surveys which have been conducted across the country- so far British Columbia and Alberta have been surveyed three times; Manitoba, Nova Scotia and New Brunswick twice, and Prince Edward Island, Newfoundland/Labrador, Yukon, Nunavut and the Northwest Territories once. A survey is currently under development in Saskatchewan. All of these reports contribute to a better understanding of a national entrepreneurial movement within the nonprofit sector.